Today I’ll be showing you how to monitor MySQL with Munin on a DirectAdmin platform. I’ve tested this setup for a customer on a CentOS box. It should be fairly easy to adapt this to Debian. You probably won’t even need to change credentials at all on a Debian box given the fact that it has an /etc/mysql/debian.cnf file by default. Although I’m not sure DirectAdmin puts it to good use. Any Debian/DirectAdmin users out there? Feel free to comment. Easy enough. 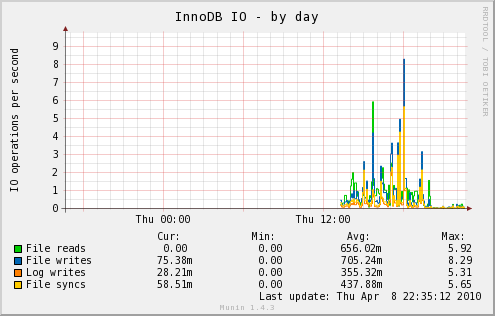 Let’s move on to installing munin and applying the credentials to the MySQL monitoring plugin. Munin isn’t available in the default repository. Not to worry, it’s in the Fedora Project’s EPEL repository for CentOS/RHEL. If you don’t have EPEL enabled yet be sure to check the excellent FAQ on the subject. Or you could just move on to installing the repository. As you can see I’ve already filled in the blanks. Gentoo ebuilds, Debian DEB and CentOS RPM packages, but I want to learn and to get more involved. Anything that would conflict my current employer. And while we’re at it, I might add another contribution related to Zabbix: a monitoring template for the Cisco Catalyst 2960-48.